Osama bin Laden long fancied himself something of a poet. His compositions tended to the morbid, and a poem written two years after 9/11 in which he contemplated the circumstances of his death was no exception. Bin Laden wrote, "Let my grave be an eagle's belly, its resting place in the sky's atmosphere amongst perched eagles." As it turns out, bin Laden's grave is somewhere at the bottom of the Arabian Sea, to which his body was consigned after his death in Pakistan at the hands of U.S. Navy SEALs. If there is poetry in bin Laden's end, it is the poetry of justice, and it calls to mind what President George W. Bush had predicted would happen in a speech he gave to Congress just nine days after 9/11. In an uncharacteristic burst of eloquence, Bush asserted that bin Laden and al-Qaeda would eventually be consigned to "history's unmarked grave of discarded lies," just as communism and Nazism had been before them. Though bin Laden's body may have been buried at sea on May 2, the burial of bin Ladenism has been a decade in the making. Indeed, it began on the very day of bin Laden's greatest triumph. At first glance, the 9/11 assault looked like a stunning win for al-Qaeda, a ragtag band of jihadists who had bloodied the nose of the world's only superpower. But on closer look it became something far less significant, because the attacks on Washington and New York City did not achieve bin Laden's key strategic goal: the withdrawal of the U.S. from the Middle East, which he imagined would lead to the collapse of all the American-backed authoritarian regimes in the region. Instead, the opposite happened: the U.S. invaded and occupied first Afghanistan and then Iraq. By attacking the American mainland and inviting reprisal, al-Qaeda  which means "the base" in Arabic  lost the best base it had ever had: Taliban-ruled Afghanistan. In this sense, 9/11 was similar to another surprise attack, that on Pearl Harbor on the morning of Dec. 7, 1941, a stunning tactical victory that set in motion events that would end in the defeat of imperial Japan. Shrewder members of bin Laden's inner circle had warned him before 9/11 that antagonizing the U.S. would be counterproductive, and internal al-Qaeda memos written after the fall of the Taliban and later recovered by the U.S. military show that some of bin Laden's followers fully understood the folly of the attacks. In 2002 an al-Qaeda insider wrote to another, saying, "Regrettably, my brother ... during just six months, we lost what we built in years." The responsibility for that act of hubris lies squarely with bin Laden: despite his reputation for shyness and diffidence, he ran al-Qaeda as a dictatorship. His son Omar recalls that the men who worked for his father had a habit of requesting permission before they spoke with their leader, saying, "Dear prince, may I speak?" Joining al-Qaeda meant taking a personal religious oath of allegiance to bin Laden, just as joining the Nazi Party had required swearing personal fealty to the Führer. So bin Laden's group became just as much a hostage to its leader's flawed strategic vision as the Nazis were to Hitler's. The key to understanding this vision and all of bin Laden's actions was his utter conviction that he was an instrument of God's will. In short, he was a religious zealot. That zealotry first revealed itself when he was a teenager. Khaled Batarfi, a soccer-playing buddy of bin Laden's on the streets of Jidda, Saudi Arabia, where they both grew up, remembers his solemn friend praying seven times a day (two more than mandated by Islamic convention) and fasting twice a week in imitation of the Prophet Muhammad. For entertainment, bin Laden would assemble a group of friends at his house to chant songs about the liberation of Palestine. Bin Laden's religious zeal was colored by the fact that his family had made its vast fortune as the principal contractor renovating the holy sites of Mecca and Medina, which gave him a direct connection to Islam's holiest places. In his early 20s, bin Laden worked in the family business; he was a priggish young man who was also studying economics at a university. 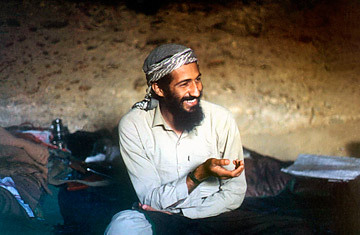 See Osama bin Laden's obituary.